Obviously, this game idea is a no-brainer, so Bezier Games, if you are reading this, you can email us to discuss development and terms. 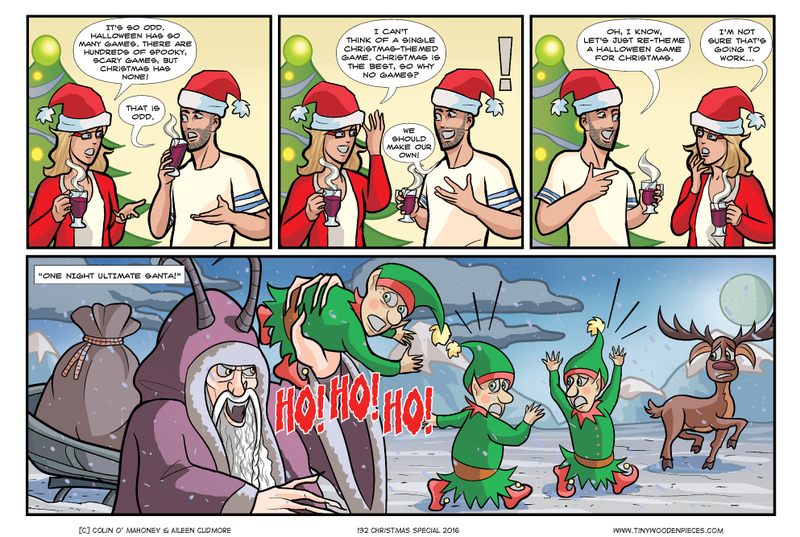 Happy Holidays to all our readers, whatever you celebrate, or don’t – be it Christmas, Hanukkah, Yule, the inexorable encroachment of the Elder gods into our world through chanting and sacrifice, or just plain, good ol’ fashioned, getting presents from other people. The important thing is you celebrate with board games and good biscuits. Good ones now, mind you. That nice tin you’ve been saving. We have one guest comic next week, featuring the return of now-frequent contributor Dave McNally, as he chronicles his continuing descent into the world of board games, along with his wife Roselyn. Expect chaos! But in a fun way, obviously. Before next week’s comic, you can catch up on their earlier exploits here, here, and here. Read together, it all forms a loose story arc that continues next week. Oh, one more thing – obligatory end of year question – post your favourite game of the year in the comments. We would love to hear from as many people as possible! FWIW, there are a few Christmas themed games. Although I think the only one I’ve played is “12 Days of Christmas” (as seen on Tabletop). My favourite-game-I’ve-not-yet-played is Captain SONAR, which finally arrived the other week after months of waiting for a new print run. I think the game I’ve had the most fun playing is actually Spaceteam, the mad real-time card game based on the real-time mobile phone game. I have gotten great enjoyment from the Spaceteam app in the past, and Captain SONAR is definitely on top of my list of games to play. Reluctant to buy it because of the required number of players. Space Cadets Dice Duel is still sitting unplayed on our shelf of shame after close to six months. I’m right there with you on the Sherlock expansion though. We played through the whole of the base game this year, and (barring the couple of dud cases) it was amazing. Such a great experience. Particularly intrigued about the four ‘linked’ cases with Jack the Ripper and how that will work. My favorite game of the year has to be Ticket to Ride, on the basis it reaches the table for than any other. Mall Santa might be my favourite Dead of Winter character. Such a great addition. Most played game is definitely a great metric for game of the year. For us that might have to be Sherlock Holmes: Consulting Detective. We got through all 10 cases, and playing it was always an engaging experience. Favourite game of the year is Scythe, without a doubt. Mostly because I didn’t get introduced to that many new games this year! Terraforming Mars and New Angeles both have potential to topple that if I get to play them more than once, though. Just this past week we have gotten to play Scythe and New Angeles both. Liked them a lot, but very much looking forward to playing them again soon and really sinking my teeth into them. I have a friend who designed a Werewolf-style game with a Krampus theme, actually. Favorite game of the year: Navegador (actually a reprint of a 2010 release) – I did more investigating of older games this year than chasing the hotness, though there were a lot of great releases this year too! I have never heard of Navegador! I will amend this with a trip to BGG and some investigating. it’s by the same designer who did Concordia. Also a great one. We always have a blast with Camel Up. It works with any crowd and any number. Love it. Hope you get a good game, and even more importantly, I hope you have a great time playing. Have a great time over the holidays! Writing that down to steal for next year. I think Pandemic Legacy might be our own game of the year as well. We are still only 4 games in, but every game we played was amazing, and the relationships and all the other additions are making it more fun, and full of theme and character with every game we play. We have already had that twice in our four games, I can’t wait to see what else the game has in store for us! Glad Yule and Happy Christmas to you, too. I’m a fan of “A World At War” by GMT games. It’s a huge monster game (essentially taking the old Third Reich game from Avalon Hill and turning it into a global game), but it works very well. Never heard of either that or the game it’s based on. 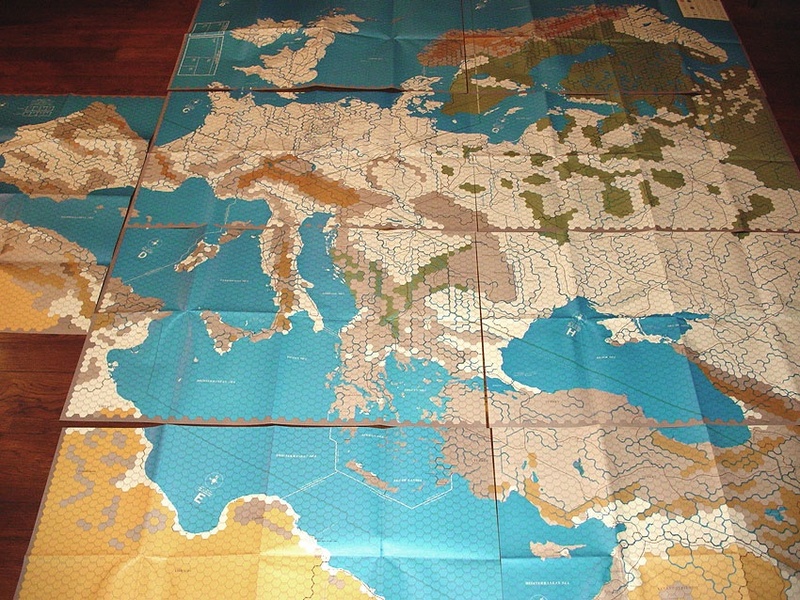 I used to hear a lot about the old Avalon Hill war games though, people talk about them very fondly. I presume it’s a super-heavy game? I think that to someone who isn’t used to the structure of a hex-and-counter wargame, it would be considered super-heavy, although that’s an adjective I reserve for ridiculously complex games like Task Force Games’ “Federation and Empire” or SPI’s old “Campaign for North Africa.” The rules are about 250 pages long, and there’s another hundred pages or so of tables, charts, and play aids. They are HOW many pages long?! Ayup! Although that’s nothing compared to the full rules for AH’s “Advanced Squad Leader” or Task Force Games’ full “Starfleet Battles” rules. Generally speaking, the core rules themselves (movement, combat, production) are relatively short. The rest is specialty sub-systems and special cases. And I thought the likes of Game of Thrones and Eclipse pushed the envelope with 30+ pages. I guess now I know what people mean by ‘heavy war games’. They mean they are crazy people. When I was in High School, back when I had a lot more time than I do now, we once played a game of SPI’s “War in Europe” over the course of about a year and a half. My friend dismantled his model railroad so we’d have a table big enough for the map (which was something like 6′ x 5′ when all nine maps were put together). I think my game of the year is Harry Potter: Hogwarts Battle. I’ve really been enjoying it so far. Potion Explosion is also pretty good. Not many other games have really stood out to me this year, and I’ve been doing a lot of discovering old games for the first time (like Transamerica and Incan Gold). Heard a lot about Hogwarts Battle, and Potion Explosion sure looks like a lot of fun. Definitely one I want to try at some point. Silent But Deadly Night and Gift TRAP come to mind as maybe being Christmas themed… but I’m not sure I’d want to play either. I feel like last years Brettspiel advent calendar had a few Christmas promos, maybe. Anyway, my favorite game of the year may well be the 1846 reprint from GMT.